CPR-143 Features: -Olympic Adapters for Smith Bar included. -Self-Oiling bushings. -Chin-Up Bar. -Integrated dip station mount. 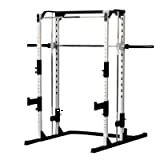 Product Type: -Smith machine. Frame Color: -White. Dimensions: Overall Height - Top to Bottom: -82". Overall Width - Side to Side: -68". Overall Depth - Front to Back: -48".